We are a leading Manufacturer of endoscopy camera ec-01 and scopy camera ec-01 from Mumbai, India. 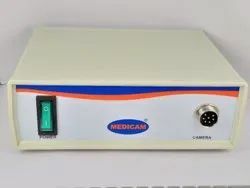 MEDICAM introduces the new state of art scopy camera which can be used with almost all the standard fibre optic scope. Features rich camera with the features like manual white balance on the camera head, ergonomic design, and lightweight body makes the camera user friendly in the sense.